"I am going to get the Coins for Change Igloo Item and pop it in my igloo. Then, I will host a contest with my friends, and we will see who can donate the most coins! Fun to earn, and fun to give! I will run around Club Penguin, ringing my bell, wearing my scarf and treasured green turtleneck! To top it off, I will find Rockhopper, I will do a jolly dance with him!" If you want a chance to win 10,000 coins, tell Club Penguin how you will be decorating your igloo for Christmas. They want to know your decorating tips! Cool? Mimo, why does the puffle on the picture have 2 bones forming an "X". Doesn't that mean like "death" or more like "halloween-related"? or is it just me? 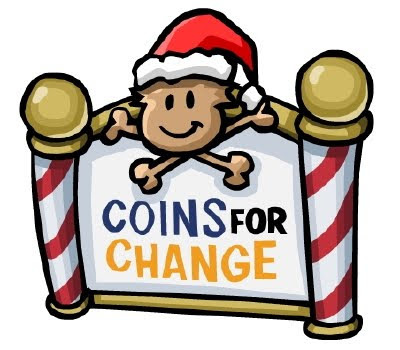 i think it doesnt look appropriate for a Christmas thing, especially Coins for Change. hmm..
Oh yeh i'm on a roll today!! Ok Mimo thanks a lot! Well, that is just something that has to do with pirates, like RH! You know, how pirates have that little crossbones symbol..
Oopsies 4got to put (CPG Mod) after my name in a comment I made! I love the Coins for Change thing. I'm a non-member, so I save tons of coins in a year. I just give them away because it's not like I can use 'em. Probably for rockhopper. Club Penguin is not violent. Yup, me and my friend noticed that, too. It's good since i think not only me but lots of new penguins get really confused with the old way, so I'm glad they improved it! dont use JUST christmas stuff, make your own design! mimo where is rockhopper please !! I have just finished decorating my newly upgraded igloo. I had been saving for coins for change, but the little cauldron in the Plaza was thronged with a rainbow of happy penguins and so I decided to buy a cauldron for my own Igloo. I have made the extra furniture, and larger igloo a christmas present to myself and I am planning to decorate it even more so that the Christmas Party I'm having in a few days (everyone invited!) will be even more full of Christmas cheer.